The textbook by Professor Wolfgang Rautenberg is a well-written introduction to the beautiful and coherent subject of mathematical logic. It contains classical material such as logical calculi, beginnings of model theory, and Goedel's incompleteness theorems, as well as some topics motivated by applications, such as a chapter on logic programming. This is essentially the English translation of the third edition of the German version [Einführung in die mathematische Logik. Ein Lehrbuch. Wiesbaden: Vieweg+Teubner (2008; Zb1 1152.03-002)] of this well-written textbook. 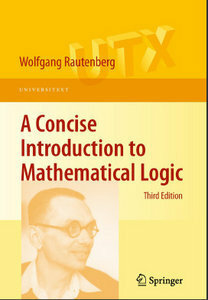 The book remains one of the most recommendable introductions into mathematical logic for mathematicians, and well-suited for computer scientists too. This book treats the most important material in a concise and streamlined fashion. The third edition is a thorough and expanded revision of the former. Although the book is intended for use as a graduate text, the first three chapters can easily be read by undergraduates interested in mathematical logic. Wolfgang Rautenberg was a German mathematician and logician whose areas of research were model theory, non-classical logic, modal logic, temporal logic and self reference.